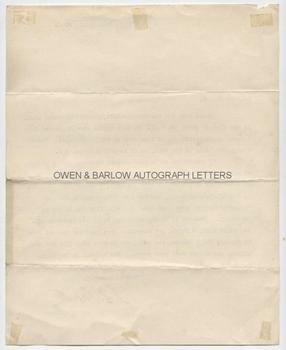 J.B. PRIESTLEY Typed letter Signed. John Boynton Priestley. English novelist, playwright and broadcaster. TLS. 1p. 54 Scarsdale Villas, Kensington, W.S. 2nd February 1926. To [Arthur St John] Adcock. "I trust that the enclosed article, about 2,700 words long, is the kind of thing you want. So many topics were suggested that I found it difficult not to flow over in all directions. Please change the title if you wish, as it is only a suggestion. If you should be wanting anybody to write on the subject of eating and drinking (I know the difficulty with this topic in connection with a series I am editing), I should like to suggest my friend, T. Earle Welby, who did that dinner series for the "Saturday Review" some time age. You will find him in the telephone directory. Mention my having suggested it if you approach him. You would also, I think, get something very good and unusual form my friend, Frank Kendon, the poet, who is also an artist and art critic, and writes very good prose. His address is The Firs, Goudhurst, Kent. Yours sincerely, J.B. Priestley. 4to. 25 x 20.5 cms (10 x 8 inches). Slight mounting residue to edges of verso. Fine. Arthur St John Adcock was a poet and novelist and was also the editor of the literary periodical 'The Bookman'. 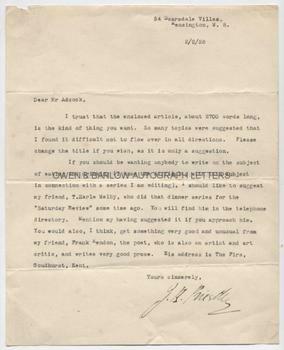 J.B. Priestley is here writing to Adcock in the latter capacity. The 29 year old Priestley was, at this time, contributing to such periodicals but had not yet published his first novel and his classic work, 'The Good Companions' was not published until 1929.